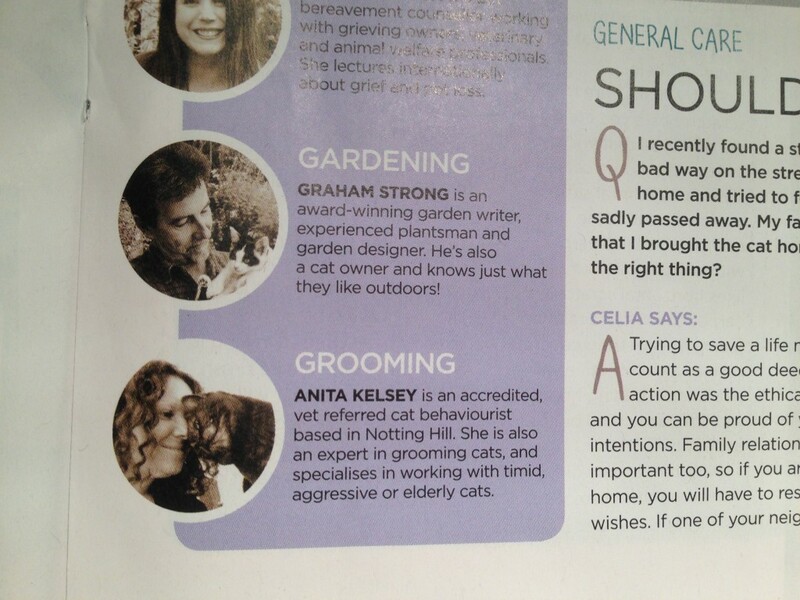 A few months ago Anita was asked if she wanted to help with answering cat grooming questions from readers of the fantastic magazine Your Cat. Of course she readily accepted and is now included in their experts panel on the questions page answering any grooming/behaviour related enquiries or cat grooming issues. Please do support this wonderful magazine which also holds a wealth of cat care information as well as fun facts and stories. Anita’s latest article ‘Keeping Your In-door Cat Happy’ is the main featured article in their December 2014 issue. Should you wish to book a cat grooming expert to visit your home and groom your cat in a holistic manner then please email grooming@catnips.co.uk. Alternatively you can complete the form on the CONTACTS PAGE. Please always include a photo of your cat in with your enquiry along with any grooming history and especially any aggressive behaviours connected to grooming. Finding a cat grooming expert in London who work holistically and with the best interests of your cat at heart is difficult. Anita is by far the best person to handle your cat in the comfort of their own home. She knows what she is doing and will not compromise the well-being of your cat to get the job done.